Medical Microbiology: Dopamine says "Make antibodies"
For a long number of years nervous system and immunological system have been seen as two separate systems. In the last couple of decades this idea has been strongly questioned. Central nervous system which has been assumed to be devoid of immune activity is now known to harbour immune system of its own (Link). Their location was quite close to prominent blood vessels. There has been some proof that neural system could in part regulate neural activity also (Link). In 2015, Louveau et al reported that the brain has a lymphatic system of its own. The anatomical discovery was surprising since the vessels’ were hidden in a location deep within the brain. Lymphatic vessel endothelial hyaluronan receptor 1 (LYVE1), is a marker of lymphatic system. LYVE1 immunostaining of whole-mount meninges is shown in Photo 1 showing distribution of brain lymphatics. There are several papers that have established that neuroimmune interactions are 2 way. 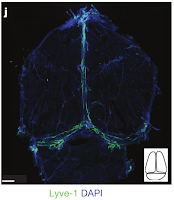 Classical nervous system molecules such as dopmaine can act on immune cells. For example, T cells express several dopamine receptors (DARs). It has been established that stimulation of specific DARs on Dendritic cells and T cells, influence CD4+ T cell differentiation into Th1 or Th17 inflammatory cells. Dopamine receptors are universally expressed in T cells, dendritic cells (DCs), B cells, NK cells, neutrophils, eosinophils, and monocytes. 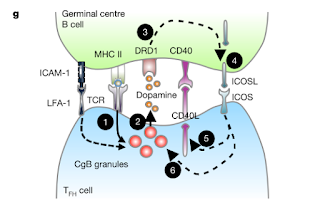 Fig 1, shows an example of established pathways on how neurotransmitters affect T cell response. Ofcourse, the reverse is also true, though the phenomenon is less well studied. A really good example is cytokines. IL-6 is now highly implicated as a Neuropoetin (Stimulate Neuronal growth), though mechanism is not clearly defined. So far, so interesting. There is convincing evidence that dopamine receptor is important. But having a receptor is one thing. There has been some research earlier suggesting that the immune cells can themselves also make dopamine and it has not been clear as to what is the role. And thats the new story. Making an antibody is a very tightly regulated process. When the immune system encounters a foriegn molecules the T cells delivers signal to B cells in a complicated molecular process. In germinal centres, highly mobile T cells and B cells specific for the same pathogen can directly interact with each other through the formation of dynamic specialized surface structures called T–B immunological synapses. In a new study by Papa etal, showed that the Follicular helper T cells or TFH (They are also known as Follicular B helper T cells) use dopamine as cargo loader for immune molecules which mediates a T-B synapse which triggers B cell maturation. between human TFH and germinal centre B cells. The first experiment goes on to show that Chromogranin B (CGB) is present in human tonsils, spleens, and lymph nodes and determined that the T cells isolated from these samples icontained granules filled with dopamine. Using a method called live-cell RNA detection CGB was shown to be present in high quantities of human germinal centre TFH cells but not so much in other T cells. Subsequent experiments showed that dopamine was not really there in detectable amounts in cells other than TFH cells. Next set of experiments showed that human TFH cells released dopamine on stimulation by germinal-centre B cells and it upregulated the ICOSL on the cell surface of germinal-centre B cells. This process was also shown to enhance accumulation of CD40L and chromogranin B granules at the human TFH cell synapse and increases the synapse area. The tests also showed that the process could be blocked by haloperidol and a DRD1 specific antagonist SKF83566, thus narrowing down the receptor to DRD1. Based on the experimental findings, the authors proposed an interaction model, shown in Figure 2. According to an explanatory accompanying paper, it has been hypothesised that TFH cells have a very stringent requirement for efficiency and specificity at the immunological synapse, which explains the finding that dopamine is used by human TFH cells, but not by human T cells of other subclasses. So now I have some questions. Is there a possible mechanism where dopamine from a neuron stimulates B cells? Does this finding explain why in certain dopamine related disorders such as schizophrenia (where there is presumably an increased dopamine actvity) have an increased autoimmune phenomenon. As Hai Qi speculates, "When disease characteristics or treatment options are associated with changes in dopamine, the possible involvement of, and implications for, antibody- mediated immunity should be considered". As Papa the lead author comments, “These particles were previously thought to only exist in neurons in the brain and we think they are, potentially, an excellent target for therapies to speed up or dampen the body’s immune response, depending on the disease you’re dealing with. Like neurons, specialised T cells transfer dopamine to B cells that provides additional ‘motivation’ for B cells to produce the best antibodies they can to help to clear up an infection. The human body has developed an advanced form of protection against bacteria, viruses and other foreign bodies that relies on the immune system". Papa I, Saliba D, Ponzoni M, Bustamante S, Canete P, Gonzalez-Figueroa P et al. TFH-derived dopamine accelerates productive synapses in germinal centres. Nature. 2017;547(7663):318-323. Qi H. Immunology: Nervous crosstalk to make antibodies. Nature. 2017;547(7663):288-290.